Omaha Beach, D-Day, June 6, 1944: When we got to the beach, I said to one of my men, Cpl. Meyers, ‘If there’s a hell, this has got to be it.’ And it was about a minute later that he got a bullet in his head. To make a long story short, only seven of the 31 men on my boat made it to the beach. On the 73rd anniversary of the Normandy invasion (June 6, 2017), six Air Force Academy cadets stood on the sands of Omaha Beach, moved by the bravery and sacrifice of the men who fought and died that day. 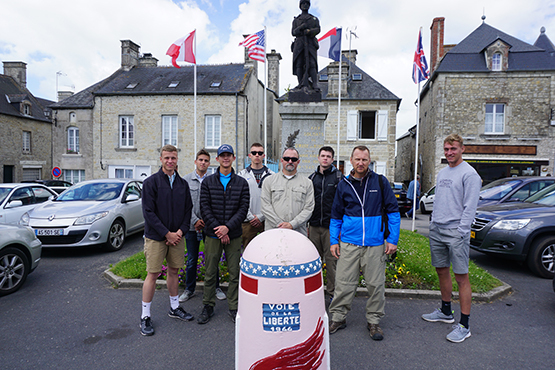 Visiting Normandy was part of the 14-day Face of Battle Staff Ride coordinated through the USAFA Department of History by Lt. Col. Mark Grotelueschen and Dr. Bob Wettemann. The ride was funded by Academy graduate Lt. Col. (Ret.) Don Raines ’86 through the United States Air Force Academy Endowment. 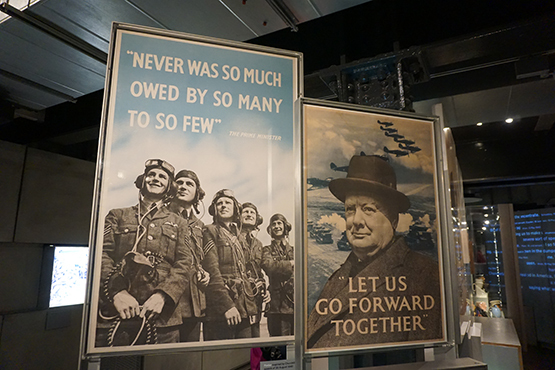 the ground running, visiting Winston Churchill’s war rooms and recounting the Battle of Britain with a visit to the Eagle Squadron Memorial, a walking tour of London highlighting key sites associated with the Battle of Britain, and a visit to the National Army Museum. When the cadets embarked on an evening crossing of the English Channel toward Normandy, they were each handed a copy of the letter that Gen. Dwight D. Eisenhower presented to the troops who made the same crossing to mount the D-Day invasion. With Eisenhower’s words fresh in their minds, the cadets prepared to begin their battlefield tour. Military historian John Keegan’s book “The Face of Battle” gave rise to the name for the ride and provided the conceptual framework for a semester- long study of six major European battles that span more than 600 years, including the medieval battle of Agincourt, Waterloo, the Battle of Somme, the Battle of Britain, the Normandy invasion and the Battle of the Bulge. 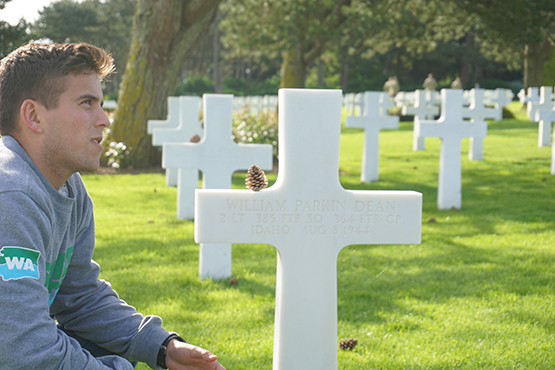 Each cadet presented graveside memorials for soldiers from his home state who are buried in either the American Cemetery in Normandy or the Luxembourg American Cemetery. C2C Charles Estep researched a paratrooper from the 101st Airborne, Warren Muck, who enlisted when he was only 17. Muck rose through the ranks to sergeant, fighting at Normandy, the Netherlands, and finally the Battle of the Bulge, where he died in a German artillery barrage near Foy. At Agincourt, King Henry V led a sick and diminished band of 6,000 British soldiers against an army of more than 20,000 French knights and infantrymen. Although King Henry and his men were outnumbered three to one, his archers unleashed deadly clouds of arrows that were said to have blotted out the sun, leading to the defeat of the French knights who were bogged down by heavy armor on a battlefield that had been turned to mud by heavy rains. The cadets imagined the horrors of trench warfare in World War I, recounting the Battle of Somme, where more than a million men were wounded or killed during the four-month campaign. The rural countryside is still pitted with craters from more than 1.7 million artillery shells that were fired during the battle. the distance they had to cover through no man’s land, and their overall objective helped me better understand the history of what happened,” says C2C Charles Estep. 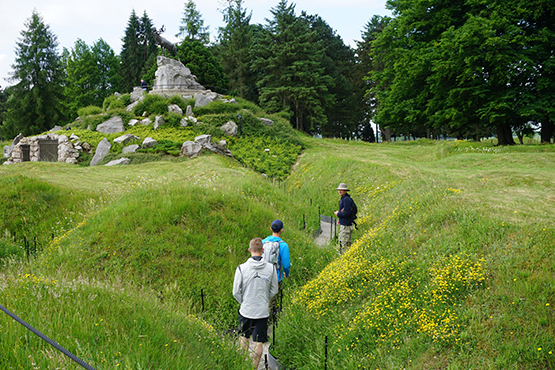 Visiting the Douaumont Ossuary and Necropolis at Verdun, which shelter the bones of more than 130,000 French and German soldiers who died in the WWI battle, gave C2C Brett Stell insight into the reluctance of the French to do battle with the Germans a second time in WWII. In Belgium, the team walked through the thickly wooded forests of the Ardennes, discovering the remnants of foxholes where Allied troops battled the German army during the Battle of the Bulge. When the cadets visited the battlefields of Agincourt, Somme and Waterloo, they were grouped into battle pairs, tasked with describing the historic conflicts from both sides of the struggle. As C1C John Wendt stepped onto the medieval battlefield at Agincourt, the historical accounts he had read prior to the trip came to life. Moving forward in time from Agincourt, the cadets explored the military achievements and ultimate defeat of Napoleon Bonaparte at Waterloo in 1815. Speaking to the team at Waterloo gave C1C Daniel Cook a new perspective on the battle. “Having to present on the Battle of Waterloo gave me a much deeper understanding of what happened in that battle,” Cook says. For 14 days, the cadets were immersed in 600 years of military history, but they also found time to experience local culture. The Face of Battle Staff Ride made a tremendous impact on the cadets. 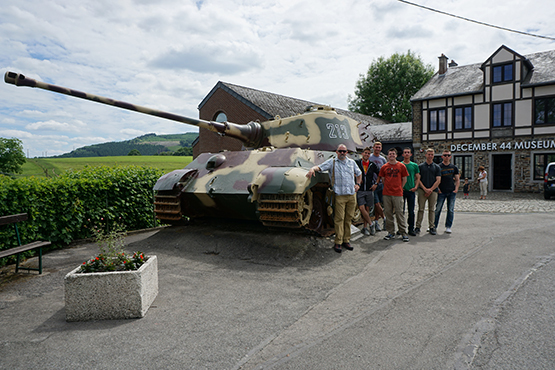 With support from Academy friends and graduates like Don Raines, Grotelueschen would like to coordinate future rides focused on different aspects of military history.